The previous post (here) laid the foundation for the discussions to follow by identifying three sets of distinctions: entries versus articles; signed versus unsigned pieces; and an authored versus an edited work. In terms of those distinctions, this post on lexica (the preferred plural of lexicon) pertains to dictionary-type works containing unsigned entries in both authored and edited works. As the terms are used here, the distinction between an entry and an article is not merely a matter of length but more of the way in which information is presented. A lexical entry generally includes a simple definition of the term, but it may also provide grammatical notes and the sources from which the meaning of the term is derived. All this is presented in list form. A dictionary article, however, usually offers a prose discussion of a word or group of related words. Examples of lexica include BDAG, BDB, CAD, LSJ, HALOT, DCH, GELS, Lane, LEH, and the other works listed in the abbreviations section below. Dictionaries that contain articles (e.g., TDOT, TDNT, TLOT, and TLNT) will be addressed in a subsequent post. After delineating general principles for referencing these works in a traditional (footnote; not author-date) citation system, the post will provide examples for the most frequently used lexica. 1. Citations of this group of lexica should be placed within a footnote, not embedded within the main text. 2. A citation of a single-volume lexicon will generally include the abbreviation for the work closed by a comma, the abbreviation s.v. (sub verbo: “under the word”), and the word as listed in the dictionary, enclosed in quotation marks. Unless normal practice dictates otherwise (see the examples below), no page number is included. Note the comma after LEH, the use of roman rather than italics for s.v., the enclosing of the headword within quotation marks, and the lowercasing of the Greek word cited. SBL Press prefers lowercasing words displayed in non-Latin alphabets even when style would otherwise specify capitalization. Note here the absence of a comma after the abbreviation (per SBL Press style for citing multivolume works), the citation of volume followed by a comma, then s.v. and the headword listed as before. The headword is set roman even when it is a transliteration, as above; the usual rule about italicizing transliterated words (SBLHS §4.3.2.5) does not apply in this case. 4. When citing two or more words from a single-volume lexicon, use the abbreviation s.vv. Modify the rest of the citation following the first example below. Multivolume dictionary citations should retain s.v. and be formatted as in the second example. 5. One should list as the title only the headword of the dictionary entry, not the additional information that is often included. For example, the LEH example above actually lists the following on the first line of the entry: ἐνθύημα, -ατος. The genitive ending -ατος need not be included in the listing of the word. However, whenever additional information is necessary for identifying the correct entry (e.g., zaqāpu A versus zaqāpu B in CAD; root I versus root II in Hebrew dictionaries), it should be included as part of the title. When the headword includes alternate forms of a word, both forms should be included in the entry title. 6. When referring to a specific section within a lexicon entry, use the labels provided in the entry itself (example) or some other common convention (e.g., BDB below). 21. CAD 21, s.v. “zaqāpu A,” 1c2′. 7. Subsequent citations of the same entry should be identical to the original. In this case there is no shortened reference. In addition, authors should not use ibid. for a repeated reference in a subsequent note. 8. Neither lexica nor any words referenced in them should be included in a bibliography. Full references should be provided only in an abbreviations list. The following examples apply the principles above to the most commonly cited lexica in the field. Readers with questions about lexica not represented are encouraged to email us at sblhs2@sbl-site.org. BDAG: The lexicon entry is formatted as follows: παρρησία, ας, ἡ. The genitive ending may be omitted, and one need not include the definite article, whose only function is to indicate the gender of the noun. BDB: Although this work has been reprinted often, its pagination has remained the same since the 1907 edition. Therefore, either of the two forms shown below is acceptable as long as an author consistently uses one or the other. The second example uses the a-b-c-d division of pages (upper and lower left, upper and lower right) used in Bruce Einspahr’s index to BDB and numerous other works. CAD: A proper citation indicates the relevant volume of this multivolume work. To specify a particular section of the lexicon entry (e.g., 1c2′), follow the pattern below, with no intervening punctuation or parentheses. For further discussion of CAD, see our earlier post here. CDME: This work lists entries first in hieroglyphic signs, then in transliteration. Most publishers will be unable to display hieroglyphs, so entry titles should use transliteration only (roman, not italics). DCH: A proper citation indicates the relevant volume of this multivolume work. Verbs are written without vowels; all other words are vocalized. A citation should reproduce the entry however it is written. DNWSI: Because the two volumes of this work are paginated consecutively, SBL Press prefers the citation style of single-volume lexica, not multivolume ones. DULAT: The two volumes of this work are paginated consecutively, so SBL Press prefers the citation style of single-volume lexica, not multivolume ones. Note further that one should include the hyphens that mark this as a verbal root (not the noun brk, “knee”) and the I that distinguishes this root from b-r-k II. GELS: Additional case endings included after the headword should be omitted from the entry title. HALOT: The two volumes of this work are paginated consecutively, so SBL Press prefers the citation style of single-volume lexica, not multivolume ones. Note further that HALOT’s entry places the II indicating that this is root II of a homonym to the left of the word; a proper citation places the II to the right of the word, for consistency with other citations. Verbs are written without vowels; all other words are vocalized. A citation should reproduce the Hebrew however it is written. Jastrow: Because the two volumes of this work are paginated consecutively, SBL Press prefers the citation style of single-volume lexica, not multivolume ones. LEH: Additional case endings included after the headword should be omitted from the entry title. LS: The lexicon entry in the example below is written as follows: ὉΡΜΗ´, ἡ. In this case the entry title should be written in lowercase letters. One need not include the definite article, whose only function is to indicate the gender of the noun. LSJ: The lexicon entry is formatted as follows: κύρτ-ος, ὁ. The hyphen before the case ending may be omitted, and one need not include the definite article, whose only function is to indicate the gender of the noun. OLD: Only the headword displayed in boldface is to be included in the entry title, not the endings that follow. In addition, the citation should not include the diacritical marks that indicate long vowels (e.g., coagmentātiō). PGL: The lexicon entry is formatted as follows: ἐπιστασία, ἡ. One need not include the definite article, whose only function is to indicate the gender of the noun. SyrLex: Citations should use a Syriac font. However, if this is not possible (as with this blog post), transliteration is permissible (roman, not italics). N.B. When an abbreviation reflects the names of the author or editors (e.g., BDAG, BDB, LSJ) it is formatted roman; when it reflects the title of the work (e.g., CAD, DCH, OLD) it is set italics, just as the title itself is. Bauer, Walter, William F. Arndt, and F. Wilbur Gingrich. Greek-English Lexicon of the New Testament and Other Early Christian Literature. Chicago: University of Chicago Press, 1957. Bauer, Walter, William F. Arndt, F. Wilbur Gingrich, and Frederick W. Danker. Greek-English Lexicon of the New Testament and Other Early Christian Literature. 2nd ed. Chicago: University of Chicago Press, 1979. Danker, Frederick W., Walter Bauer, William F. Arndt, and F. Wilbur Gingrich. Greek-English Lexicon of the New Testament and Other Early Christian Literature. 3rd ed. Chicago: University of Chicago Press, 2000. Brown, Francis, S. R. Driver, and Charles A. Briggs. A Hebrew and English Lexicon of the Old Testament. Oxford: Clarendon, 1907. * Reprinted by various publishers. Gelb, Ignace J., et al., eds. The Assyrian Dictionary of the Oriental Institute of the University of Chicago. 21 vols. Chicago: The Oriental Institute of the University of Chicago, 1956–2010. * The publication years given here are correct; the SBLHS 2 listing contains an error. Faulkner, Raymond O. A Concise Dictionary of Middle Egyptian. Oxford: Griffith Institute, 1962. * The identification of Faulkner as author rather than editor corrects an error in SBLHS 2. Güterbock, Hans G., Harry A. Hoffner Jr., and Theo P. J. van den Hout, eds. The Hittite Dictionary of the Oriental Institute of the University of Chicago. Chicago: The Oriental Institute of the University of Chicago, 1980–. Clines, David J. A., ed. Dictionary of Classical Hebrew. 9 vols. Sheffield: Sheffield Phoenix, 1993–2016. * The publication years given here are correct; the SBLHS 2 listing contains an error. Hoftijzer, Jacob, and Karen Jongeling. Dictionary of the North-West Semitic Inscriptions. 2 vols. Leiden: Brill, 1995. Olmo Lete, Gregorio del, and Joaquín Sanmartín. A Dictionary of the Ugaritic Language in the Alphabetic Tradition. Translated and edited by W. G. E. Watson. 3rd ed. 2 vols. Leiden: Brill, 2015. Muraoka, Takamitsu. A Greek-English Lexicon of the Septuagint. Leuven: Peeters, 2009. Koehler, Ludwig, Walter Baumgartner, and Johann J. Stamm. Hebräisches und aramäisches Lexicon zum Alten Testament. 3rd ed. Leiden: Brill, 1995, 2004. Koehler, Ludwig, Walter Baumgartner, and Johann J. Stamm. The Hebrew and Aramaic Lexicon of the Old Testament. Translated and edited under the supervision of Mervyn E. J. Richardson. 2 vols. Leiden: Brill, 2001. Puhvel, Jaan. Hittite Etymological Dictionary. Berlin: Mouton, 1984–. Jastrow, Morris, comp. A Dictionary of the Targumim, the Talmud Babli and Yerushalmi, and the Midrashic Literature with an Index of Scriptural Quotations. London: Luzac; New York: G. P. Putnam’s Sons, 1903. * Reprinted by various publishers. Koehler, Ludwig, and Walter Baumgartner. Lexicon in Veteris Testamenti libros. 2nd ed. Leiden: Brill, 1958. * The first and second editions of HAL were published under this title. Lane, Edward W. An Arabic-English Lexicon. 8 vols. London: Williams & Norgate, 1863. Repr., Beirut: Libr. du Liban, 1980. Lust, Johan, Erik Eynikel, and Katrin Hauspie, eds. Greek-English Lexicon of the Septuagint. Rev. ed. Stuttgart: Deutsche Bibelgesellschaft, 2003. Brockelmann, Carl. Lexicon Syriacum. 2nd ed. Halle: Niemeyer, 1928. Liddell, Henry George, and Robert Scott. 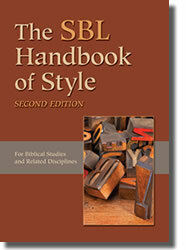 An Intermediate Greek-English Lexicon: Founded upon the Seventh Edition of Liddell and Scott’s Greek-English Lexicon. New York: Harper & Brothers, 1889. Reprinted often by various publishers. * Freely available online here. Liddell, Henry George, Robert Scott, and Henry Stuart Jones. A Greek-English Lexicon. 9th ed. with revised supplement. Oxford: Clarendon, 1996. * This abbreviation is incorrectly italicized in SBLHS 2 §8.4.2. Glare, P. G. W., ed. Oxford Latin Dictionary. Oxford: Clarendon, 1982. Lampe, Geoffrey W. H., ed. Patristic Greek Lexicon. Oxford: Clarendon, 1961. Sokoloff, Michael. A Syriac Lexicon: A Translation from the Latin, Correction, Expansion, and Update of C. Brockelmann’s Lexicon Syriacum. Winona Lake, IN: Eisenbrauns; Piscataway, NJ: Gorgias, 2009. Erman, Adolf, and Hermann Grapow. Wörterbuch der ägyptischen Sprache. 5 vols. Leipzig: Hinrichs; Berlin: Akademie, 1926–1931. * Repr. with two additional volumes in 1963.
s.v. stands for “sub voce” (or “sub verbo”). Keep up the good work! As two careful readers have noted and as we state in the SBLHS 2 4.3.2.5., s.v. should stand for sub verbo, not sub verso. We have updated the post to correct this error.